Historically, brokers and consultants have helped employers manage the cost of pharmacy benefits by focusing on negotiating pricing arrangements for drugs through discounts and rebates. As long as pharmacy benefit managers (PBMs) pass through most or all of the rebates and discounts to employers — especially for specialty drugs, which can cost thousands of dollars per script — employers should save a significant amount from retail pricing. Cost resulting from a claims repricing most often tells only part of the story. Self-insured employers and their consultants must also consider which PBM proposal promises better utilization and product mix. Clinical information, utilization and product mix, is sometimes more important than the repriced claims! Ignore it or not pay it enough attention and the result will be wasteful spending and poor outcomes on both the pharmacy and medical side. How would you know which PBM proposal is best? The contract language will tell you which option is best that's how. Don't rely solely or too heavily on repriced claims data it is fools gold. Of course, results will vary based upon the decision-maker's level of industry knowledge and negotiating skills. Sophisticated purchasers who know the ins and outs of PBM revenue models and contract loopholes will fare far better than those who are "picking it up" as they go. 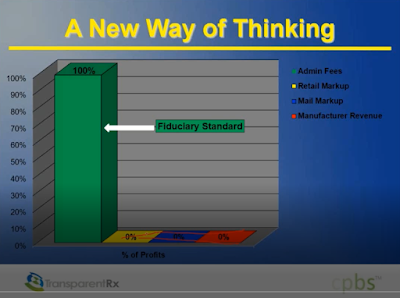 Even if a self-insured employer wins back all manufacturer dollars (rebates) and eliminates all spread pricing including back-end fees a non-fiduciary PBM could still shift their hidden fees to the clinical side, for example. So while many self-insured employers have their front doors locked, non-fiduciary PBMs are sneaking in through your back and basement doors. Caveat Emptor. While this strategy helps save money and should continue to be used, there’s another tremendous opportunity that many employers are leaving on the table: reviewing drug formularies and claims from a clinical perspective. This practice can help plan sponsors determine the lowest net cost for a treatment.